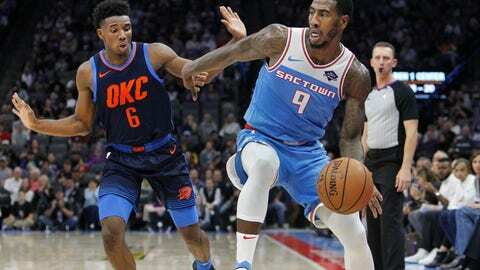 OAKLAND, Calif. (AP) — Thunder rookie Hamidou Diallo avoided a serious leg injury after a hard fall in the fourth quarter of Oklahoma City’s 123-95 win at Golden State on Wednesday night. He was carted off on a stretcher with 7:17 left after crashing to the floor and colliding with Warriors forward Jonas Jerebko. The team said Warriors team physicians ruled out a severe injury based on X-rays from the left knee and below. Diallo was to be re-examined Thursday in Oklahoma. Diallo’s left leg was stabilized as he was wheeled away to applause from the Oracle Arena crowd. Diallo was credited for rebounding Jerebko’s missed layup when they went down. Clearly in pain, Diallo moved himself off the court and was under basket for several minutes. In a loss Monday at Sacramento, Diallo became the first Thunder rookie ever to go at least 7 for 7 from the floor. He made both his 3-point tries on the way to 18 points.